The tutorial is part 2 of our #tidytuesday post from last week, which explored bike rental data from Washington, D.C. Check it out here. The following tutorial will use a gradient boosting machine (GBM) to figure out what drives bike rental behavior. GBM is unique compared to other decision tree algorithms because it builds models sequentially with higher weights given to those cases that were poorly predicted in previous models, thus improving accuracy incrementally instead of simply taking an average of all models like a random forest algorithm would. By reducing the error iteratively to produce what will become the final model, GBM is an efficient and powerful algorithm for classification and regression problems. Implementing GBM in R allows for a nice selection of exploratory plots including parameter contribution, and partial dependence plots which provide a visual representation of the effect across values of a feature in the model. The packages below are needed to complete this analysis. Run previous scripts to import and wrangle data. What did we learn in part 1? The exploratory data analysis showed us that bike rentals seem to drop off at a certain temperature (~20˚C). And that rentals were lower on holidays compared to non-holidays. So now that we have some understanding of the variables in BikeData, we can use the Generalized Boosted Regression Models (gbm) package to model the bike rental data. atemp = num [1:731] 28.4 28 22.4 23.2 23.8 ..
We want to build training and testing data sets that are representative of the original bike data set. To achieve this, we will randomly select observations for two subsets of data. We’ll also specify the sampling process, so we get an equal proportion of bike rentals (cnt) in our BikeTest and BikeTrain data sets (we’ll randomize our data into training and test sets with a 70% / 30% split). The BikeTrain has the data we will use to build a model and demonstrate it’s performance. However, because our goal is to generalize as much as possible using ‘real world data’, we’ll be testing the model on data our model hasn’t seen (i.e. the BikeTest data). Having testing and training data sets allows us to 1) build and select the best model, and 2) then assess the final model’s performance using ‘fresh’ data. We can call the gbm function and select a number of parameters, including cross-fold validation (cv.folds = 10). Cross-fold validation randomly divides our training data into k sets that are relatively equal in size. Our model will be fit using all the sets with the exclusion of the first fold. The model error of the fit is estimated with the hold-out sets. Each set is used to measure the model error and an average is calculated across the various sets. shrinkage, interaction.depth, n.minobsinnode and n.trees can be adjusted for model accuracy using the caret package in R http://topepo.github.io/caret/index.html. # a shrinkage parameter applied to each tree in the expansion. # of observations, not the total weight. # functions in the additive expansion. NOTE: The gbm::gbm() function creates a lot of output (we included the verbose = TRUE argument). Now we can inspect the model object (bike_fit_1) beginning with the optimal number of learners that GBM has produced and the error rate. We can use the gbm::gbm.perf() function to see the the error rate at each number of learners. In the visualization below we can see that the blue line represents the optimal number of trees with our cross validation (cv). GBM can be sensitive to over-fitting, so using the method = "cv" in our estimate protects against this. Now we can predict our bike rentals using the predict() function with our test set and the optimal number of trees based on our perf.gbm1 estimate. RMSE = The root mean squared error (RMSE) is used to measure the prediction error in our model(s). As the name suggests, these errors are weighted by means of squaring them. The RMSE is also pretty straightforward to interpret, because it's in the same units as our outcome variable. 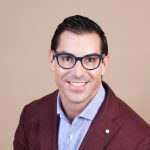 Additional attractive qualities include the fact equally captures the overestimates and underestimates, and the misses are penalized according to their relative size. Metrics::rmse computes the root mean squared error between two numeric vectors, so we will use it to compare our predicted values with the residuals to calculate the error of our model. GBM offers partial dependency plots to explore the correlations between a feature in our model and our outcome. For example, you can see in the graph below that ambient temperature is associated with increased numbers of bike rentals until close to 35 degrees when riders tend to be less likely to rent a bike. Similarly we can look at the interaction of two features on bike rentals. Below we can see that riders are more likely to rent a bike after Monday, despite wind speed. We can visualize the impact of different features on predicting bike rentals using the relative influence provided by GBM. First we can summarize our model then assign these data to a tibble using gbm::summary.gbm() and passing this to the tibble::as_tibble() function. This creates a new data set with var, a factor variable with the variables in our model, and rel.inf, the relative influence each variable had on our model predictions. We can then plot the top ten features by impact using ggpplot and our new data frame containing our model summary (BikeEffects). We can visualize the distribution of our predicted compared with actual bike rentals by predicting these values and plotting the difference. We can see that our model did a fairly good job predicting bike rentals. 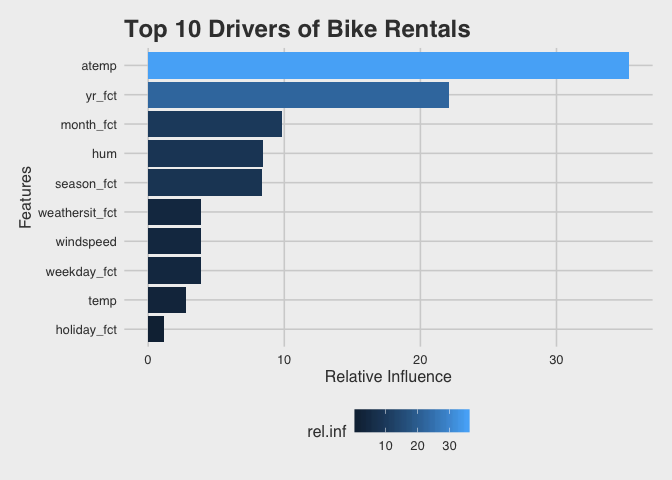 We learned the ambient temperature is the largest influencer for predicting bike rentals and that rental numbers go down when the temperature reaches ~35 degrees. We can also see holiday (or non-holiday) was not much of an influencer for predicting bike rentals.